A complete guide to the the disassembly, inspection, overhaul and reassembly of the Cushman Cast Iron Engine. For those who don't plan to overhaul their engine, the manual provides complete specifications and helpful maintenance and upgrade information. The manual is printed by the company that prints the Cushman Club of America magazine using the same high quality paper. Click the link for more information. This site is devoted to the Cushman Motor Scooter. It contains information pertaining to restoration and preservation of Cushman Scooters, including historical and technical articles, show pictures, national and regional club information, original Cushman technical bulletins, and links to other Cushman related sites. This site also features information on Crystal Radio sets, including pictures of sets that I have built plus technical and nostalgic information. Click the "My Crystal Radio Page" in the left margin. Cushman Motor Scooters were built in Lincoln, Nebraska from 1936 until 1965 by the Cushman Motor Works. Cushman had been in the engine business since 1901 and began manufacturing scooters as a way to sell more engines. Cushman Scooters and the Cushman Husky engine were used at military facilities during WW2. Cushman made an Airborne version for the military with a channel iron frame that was designed to be dropped by parachute. This model is shown in picture three. The 50 Series Step Through Scooter, picture four, was introduced in 1946 and the improved but similar appearing 60 Series started in 1949. The very successful Cushman Cast Iron Eagle, pictures one and five, was introduced in 1950 and continued into 1963. Another variations of the Eagle was the Super Eagle which had a dress-cover over the rear section, introduced in 1959, picture two. The Silver Eagle with a 9 HP aluminum OMC engine, was introduced in 1961. 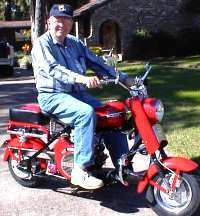 Cushman made many other models of motor scooters and Trucksters over the years. Since 1965 they have made only specialty vehicles. 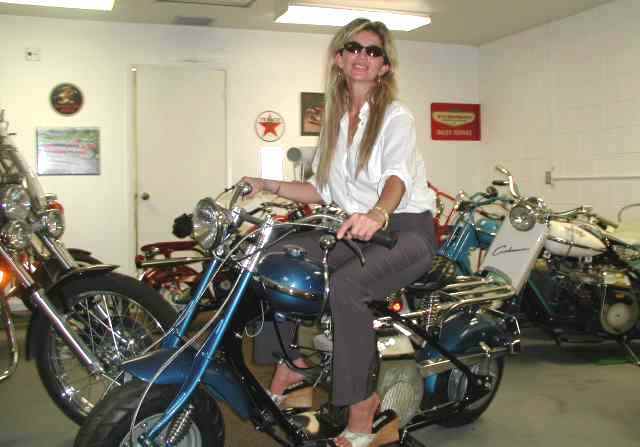 See the Cushman Time Line page for the model years and the Cushman ID page for pictures of all two-wheel models that were built from 1936 to the end of the line in 1965. For those who plan to service or overhaul your Cushman Cast Iron Engine my Cushman Engine Manual is a must. It has all the information you will need to rebuild the engine. Click here or at the Overhaul Manual link in the left column on this page for more information. Be sure to view the Technical Index page. This page will direct you to a multitude of information on almost any aspect of Cushman Scooter repair and restoration. This page is a must for any new Cushman owner. The Hints & Tips page is especially useful and will answer a lot of questions for new owners. The Vanguard Center index page features information about Cushman Scooters that have be retrofitted with the Briggs & Stratton V-Twin Vanguard engine. Installing the Vanguard engine has become a very popular option. The more powerful engine can make a Cushman Scooter much safer in today's traffic, with much more acceleration and a top speed exceeding the legal limit. The last picture on this page is of a Vanguard Eagle. The Historic Index page is the gateway to many nostalgic stories submitted by our readers. Included is a excellent ten part series on "Who Saved The Cushman Scooter" written by Bob Jungbluth, an avid early Cushman parts collector. Be sure to check out the Cushman Dealers page for information about our vintage parts vendors. Half of the battle is finding the parts you need - these guys can help! And finally, check out my Crystal Radio pages. Here you will find nostalgic and technical information on early crystal sets including one sold by my grandfather in 1915. You will also find information for state of the art present day crystal radio construction. Every Cushman Enthusiast should join the Cushman Club of America for the latest information and articles on Cushman Scooters. The Cushman Club of America has approximately 5200 active members. This web site has referred over 1000 new members to the Club. A full color club magazine is published six times each year. A National Meet is held each Summer somewhere in the US. Back issues of the Club magazine are also available. For more information click the link above. For more information on Cushman Scooters and the history of the Cushman Motor Works see A History of the Cushman Motor Works, The Complete Guide to Cushman Motor Scooters and A History of the Cushman Eagle by Bill Somerville, available from any of our vintage Cushman Dealers. Entire site Copyright � 1999-2015 by Jim Frederick.